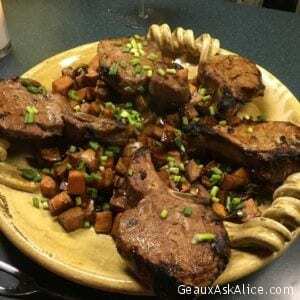 Grilled Bone-In Pork Rib Chops with Balsamic Glazed Yams! Place the seasoned chops in a large zip lock bag. Pour the marinade into the bag. Add the sage to the bag. Seal the bag and with your hands massage the bag to work the marinade all over the chops. Place in refrigerator overnight. In a large baking pan, spray with PAM. Place the cubed yams into the dish. Sprinkle the rosemary leaves all over. With your hands, mix the yams so that they are well coated. Place in a 350 oven for 1 hour or until tender when pierced with a fork. Stir occasionally. Cover with foil and set aside or just keep in warm oven. Drain chops from marinade and grill until slightly pink in center or to the degree you like it. On a large serving platter, place the yams on the bottom of platter. Drizzle the yams with the balsamic glaze. Place the grilled chops on top. Garnish with green peppers. Serve. *****The number of yams will depend on size of the yams. If they are very large, figure 1 per person. If they are small you can figure 2-3 per person. You can find balsamic glazes at speciality stores or on line. I love these products and have a variety on hand. They can also come with infused flavors.